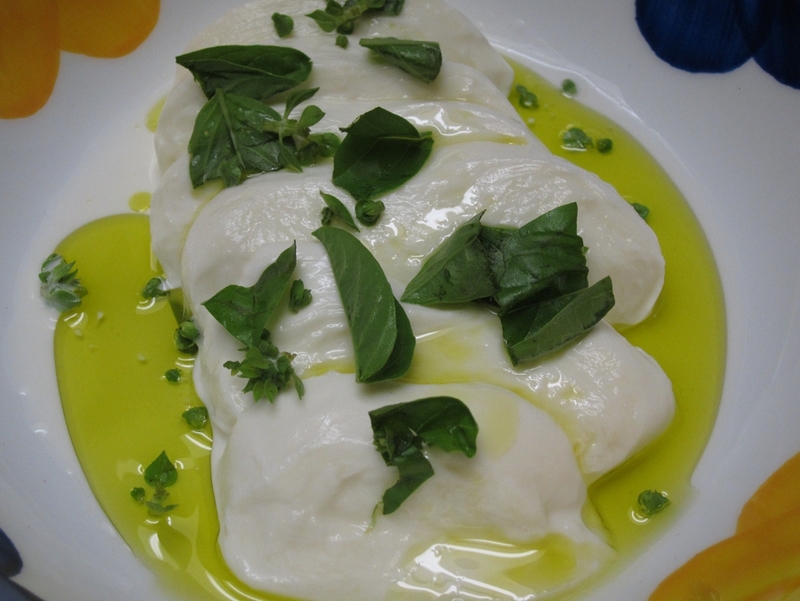 I’ve tried making mozzarella a couple of times before with no success..until now. This was fantastic. The recipe that worked for me was from the “Ideas in Food” book (I just did not use the Lipase enzyme). Now, this time I used raw non-homogenized milk from a farm. So, it still remains to be seen if I can repeat this success with regular store-bought whole milk. The recipe is simple, but I think the details are important, especially temperature. The basic idea is to warm the milk slightly, then mix in citric acid and rennet (Whole Foods sells rennet by the way). Let those sit so the milk can acidify a little and the rennet can start making milk curds. I cut the curds, still in the whey, and heat the mixture gently again to a specific temperature. 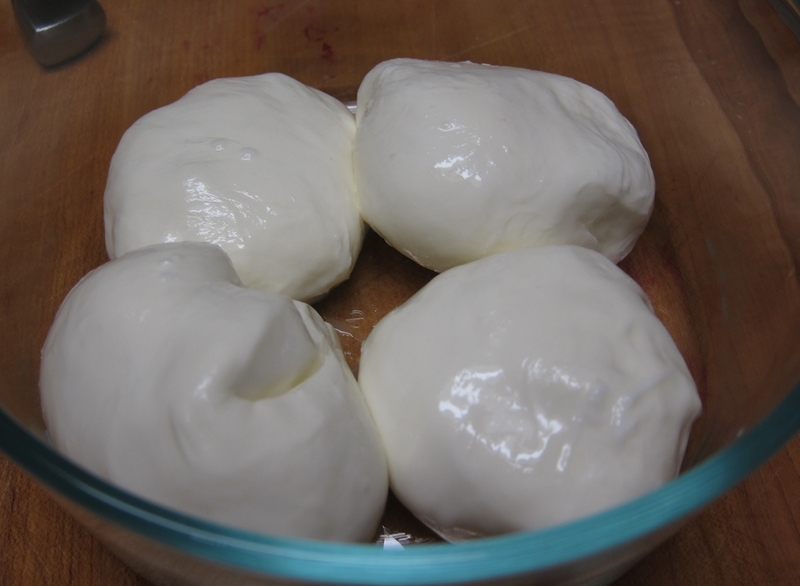 Last step is to drain he curds and then melt them, stretch and knead them in very hot salted whey in order to form those mozzarella balls. Aesthetically, this dish needs work, but I am extremely proud of how delicious it was. The flavors popped and worked brilliantly together. It was fresh, healthy and refined. Cooking from the NOMA cookbook is not an easy feat. NOMA in Copenhagen is the new “Best Restaurant in the World”. Rene Redzepi’s cuisine is fiercely local, and in Scandinavia local means sea buckthorn, spruce, dulse seaweed, bulrushes and whole bunch of other wild edibles. This recipe is by no means from that book, but it was inspired by a recipe from it. I already had the purple and yellow carrots on hand and was wondering how to best serve them in a vegetarian dish and while flipping through the Noma book, which focuses a lot on vegetables, I came across the recipe he calls “Vegetables from Lammefjorden, Sea Buckthorn and Gooseberries“. No sea buckthorn or gooseberries for me at this time. 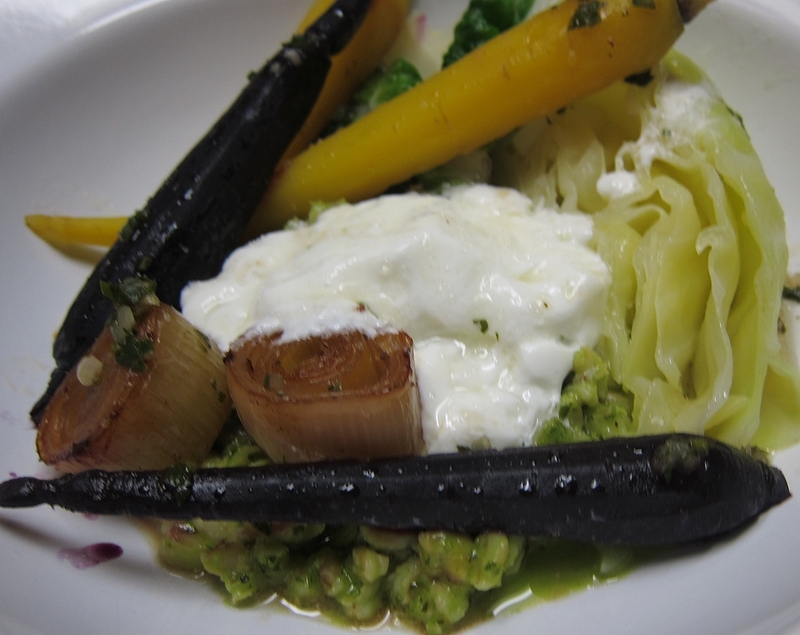 So, I stole the idea for the custardy fresh cheese combined with perfectly cooked vegetables (that are definitely not from Lammefjorden) and a brown butter-chicken glace sauce. Purple Carrots, peeled but left whole and bagged with butter, salt and a teaspoon or so of sugar. Cooked sous vide at 85C for about 1.5 hours. 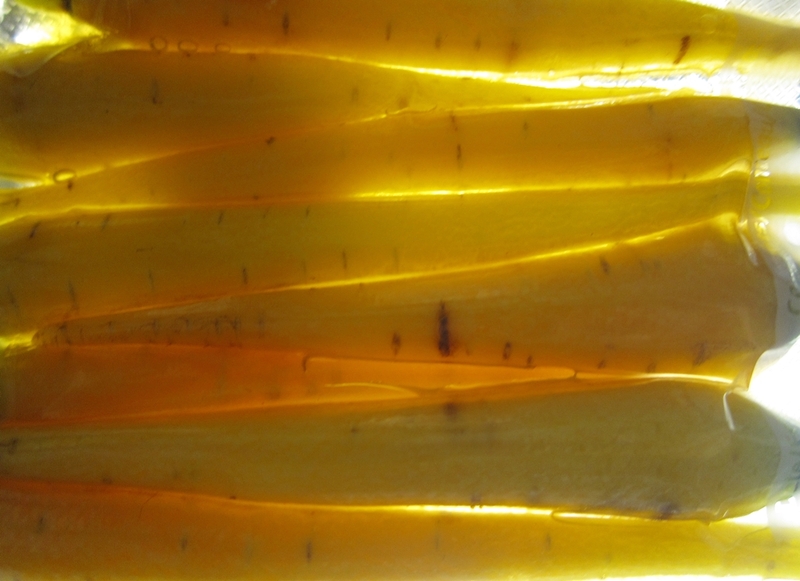 Yellow Carrots, peeled but left whole and bagged with butter, salt and a couple of teaspoons of honey. Cooked sous vide at 85C for about 1.5 hours. Leeks, cut into 2 inch rounds and oven-braised with butter, water and Oloroso sherry. Before serving they were seared over high heat. 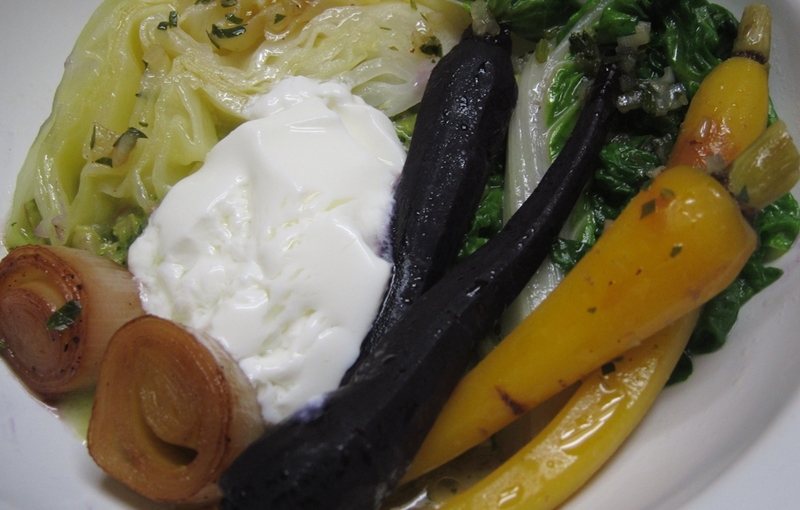 Cabbage, cut into thin wedges and blanched in salty water then refreshed in an ice bath. Heated in beurre monte (butter/water emulsion) before serving. Swiss chard, inner smaller leaves blanched in salty water then refreshed in an ice bath. Heated in beurre monte (butter/water emulsion) before serving. The base for the dish is a porridge of sorts, but not a mushy gruel, rather its grains are distinct and the flavors are fresh and savory. This is based on Heston Blumenthal’s famous dish from the Fat Duck. He uses regular rolled oats and tosses them in a mixture of parsley butter. Auldo from “The Big Fat Undertaking” blog cooked and wrote about it here. I used barley because I love its texture and flavor. I also made my own parsley butter sauce that uses a good dose of umami-rich Miso to complement all the vegetables in the dish. The end result is fantastic and I will definitely be making this as a side dish or a starch for future meals. The recipe for it is posted at the end of this entry. 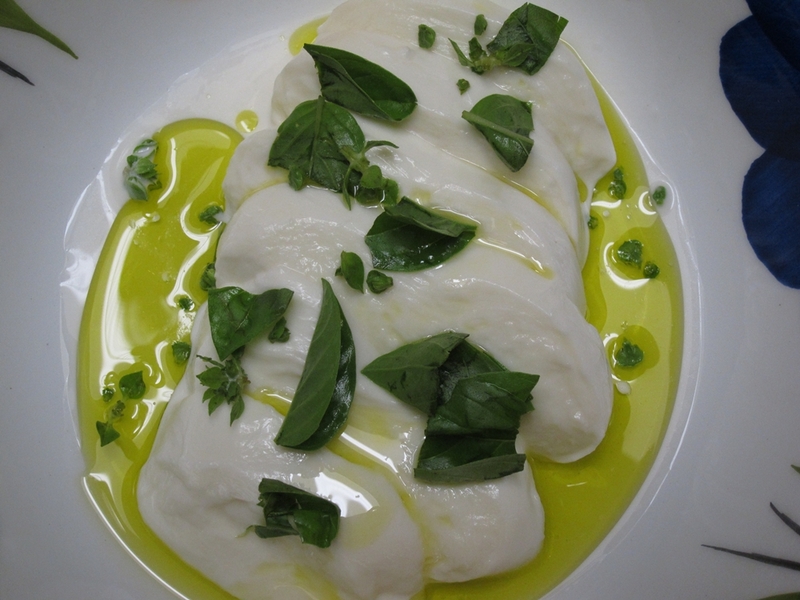 The fresh cheese is from the Noma recipe. It’s made from milk, cream, buttermilk and rennet. It’s allowed to set at a very low temperature until it resembles very soft tofu. To serve, it is just spooned on top of the porridge. The other component from the Noma recipe is the brown butter sauce. That’s made from reduced chicken stock, brown butter, balsamic vinegar, shallots and parsley. Put the barley in a pot with plenty of water and bring to a rolling boil. Drain the barley and put them back in the pot with the leek and salt and cover with about 2 inches of water. Bring to a boil and cover. cook on a gentle heat until tender, about 20-25 minutes. When done there should be very little or no water left. 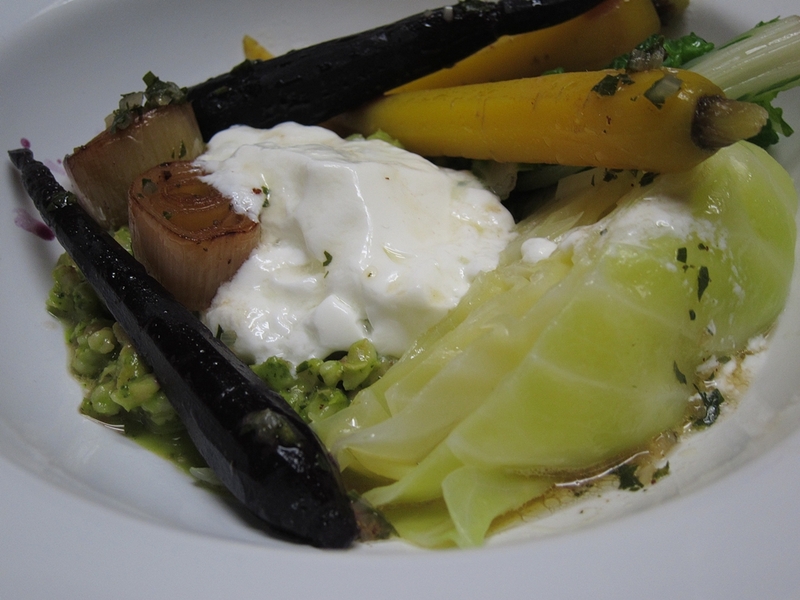 The barley should be tender but with a toothsome texture. If not, add a little more water and cook a bit longer. Make the Parsley-Miso butter by pureeing everything together until as smooth as possible. Pass through a sieve if you want to but I did not. 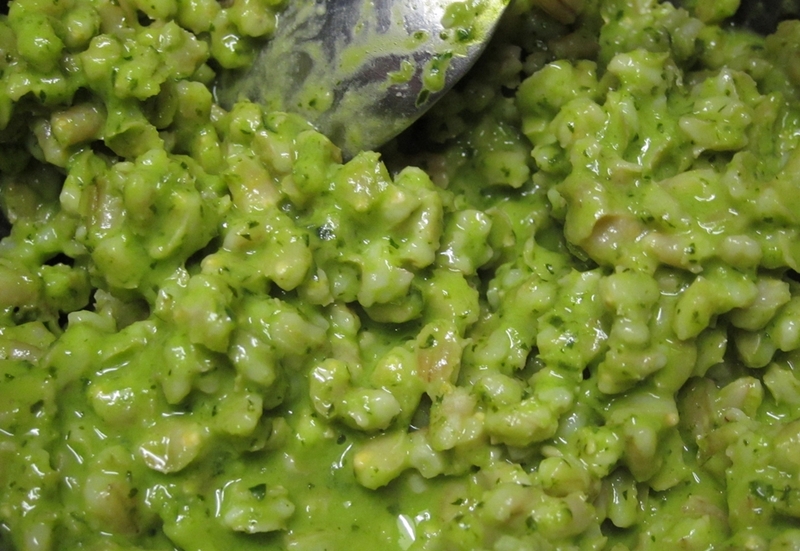 Finish the porridge by mixing in the Parsley-Miso butter while the barley is very warm and serve it immediately. The barley can be made a day or two ahead of time. In that case heat it in the pot with a couple fo tablespoons of water before mixing in the parsley-Miso butter.